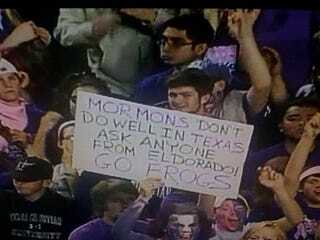 This was a pretty hilariously awful sign posted during last night's TCU trouncing of BYU, where students name-dropped the spooky El Dorado church compound raids in order to intimidate the supposedly up-and-coming Cougars. It worked, obviously. So, there will be a couple of announcements on Monday. Nothing too major, some obvious stuff, and a couple of commenting adjustments that will surely make you angry. Hopefully not. But there's a great weekend of sports afoot and luckily you'll have Marcel Mutoni and Gourmet Spud to guide you through the eventual BCS upsets and the Red Sox/Rays Game Six. If there is a Game Seven, super live-blogger boom-diggity Matt Sussman has promised he'll remove himself from the hyperbaric chamber to let his fingers relay the madness. Oh. Stories this week: • Rick gets yelled at by a man who could rip out his kidneys • Will tells us all about his birthday. And politics. Oh, and the NFL. • Scoop Jackson insults the masses • Big Wang's bans Dodger gear • The Cowboys make some moves • Rangers prospect dies on bench • Big Brown bids adieu • And, of course, your National League Champion Philadelphia Phillies: WHY CAN'T US? Thank you for your continued support of Deadspin. Enjoy the weekend. I'll be back with another of those block rockin' SKEETS, on Monday.